Where do I use my Harveys voucher code? Select the deal of your choice from NetVoucherCodes. Click through to the Harveys website and browse for goods. Select ‘Add to Basket’ on products you wish to buy. Review your basket then add your code by clicking ‘Have you got a promotional code?’. A box will appear for you to add your code. Select ‘Checkout’ to complete your transaction. 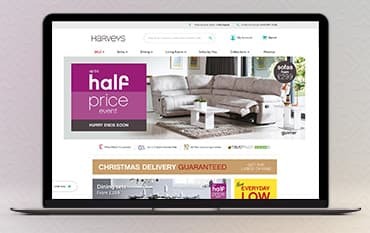 As the first largest furniture specialist provider in the UK, to this day, Harvey’s still remains the largest brand in the business with over 150 stores nationwide. Harvey's can ensure quality furniture for your lounge and dining room at value prices. For Harvey’s, It isn’t about been the cheapest on the market, it’s about providing quality goods, ensuring value for money and 100% customer satisfaction. Harvey’s aim to inspire you with the intelligent styling and design to make your furniture work for your busy home life. You can rest assured that not only can you guarantee quality furniture, but the friendly service to go with it. Are you searching for your ideal sofa? The choice can be a little overwhelming as there's so many different styles to pick from, but at Harvey’s you can browse a little easier as they’re always on the lookout for ways to make your life a bit more simple. Whether it’s a modern corner suit style in a host of ranges from leather to a delicately soft cord, Harvey’s have the finest collection of corner sofas in a whole host of styles which are spacious and with that extra added relaxation, there is comfort the whole family can enjoy. Perhaps something a little smaller? A fantastic range of 4 seater, 3 & 2 seater sofas are available at Harvey’s, perfect for giving your living room that cosy touch. Team your sofa up with some stylish cushions and give your living space that modern edge. You are sure to find the perfect sofa at Harvey’s so check out the brilliant collection now! Harveys is the largest furniture specialist in the UK and prides itself on an outstanding delivery service as part of a leading global furniture group. With a Harveys voucher code, you'll get more for less with quality furniture at value prices for lounges and dining rooms across the country. A full range of dining tables and chairs, sofas, display cabinets, coffee tables, mirrors and rugs are all available online with some cracking web offers, pay by finance deals and care and style guides. Care kits are also available to keep your intelligent and stylish design choices in tip-top condition, with choices of 3 or 5 years Care Protection Plans to ensure they continue giving you comfort and satisfaction for years to come.